Planning a wedding can feel overwhelming, but with the help of these Pinterest boards you can create a beautiful wedding that will wow your guests. 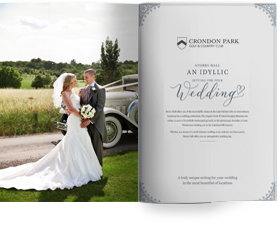 Organising a wedding from scratch can be a little overwhelming; with so many different options to choose from for each little element – from the dress, to the flowers, to the colour scheme – it is often difficult to know where to start. Luckily there are lots of sources of inspiration out there, including wedding magazines, friend and family weddings, television programmes and, most recently, social media. Pinterest in particular is a fantastic source of wedding ideas, and whether you’re organising a grand, lavish wedding, or planning a more intimate affair in a wedding venue in Essex, you’re sure to find some inspiration on this popular image curation site. Here are our picks of some of the best Pinterest wedding boards. For the majority of brides, finding the perfect dress is one of the most important elements of the wedding. But with so many different styles and variations out there, it can be difficult to know where to begin. Gretchen Jones can help you to narrow down the field. Her minimal, modern and understated ‘If ever’ wedding board is full of cool and unique wedding dress designs that will help you to identify the styles and shapes you like, before you set foot in a bridal store. All brides want to look their best on their big day, and hair and make-up is a big part of that. They All Hate Us’s Locks board is a great source of inspiration, featuring runway-inspired bridal hairstyles, from formal braided up-dos to boho loose waves with scattered pieces of baby’s breath. Reformation’s slightly edgier board also has some great and achievable ideas for bridal hair and make-up looks. Good food is an essential part of any event, and your wedding is no exception. Get inspiration for your canapes and wedding breakfast menu from Another Feather’s “eat+drink” board. This hunger-inducing board features beautifully-styled and photographed recipes, from fresh summer salads to homemade pasta and delicious desserts. Just be warned – it will make you hungry! After all the hard work of organising a wedding, you want to relax and de-stress with a chilled out, romantic honeymoon. Fig & Salt’s travel board hosts a wealth of travel ideas for any couple, whether you are looking to soak up the sun on the Caribbean islands, or explore the winding roads (and delicious cuisine) of rural Italy. Flowers can add the perfect finishing touch to any wedding, from a beautiful bridal bouquet to eye-catching centrepieces. If you’re looking for some floral inspiration for your big day, you might want to check out the Blondielocks’ ‘Flowers’ board. With hundreds of floral posts of all styles and colours, you’re sure to find some inspiration to help you take your wedding flowers to the next level. This is just a taster of the tools that are out there to help you plan your big day. Of course, everyone’s taste is personal and we recommend taking these boards as a starting point and adapting their ideas to suit the preferences of you and your other half. By using these ideas and injecting your own personality you can create a Pinterest-worthy wedding that will wow your guests.